Moss – Do you Love it or Hate it? 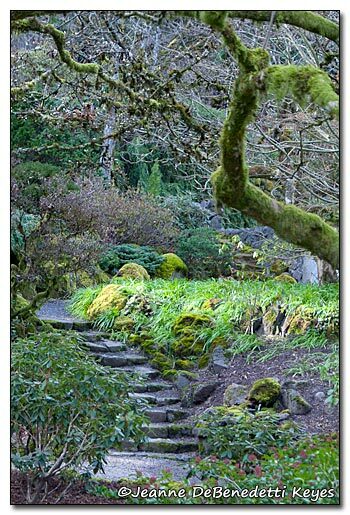 If you live in the Pacific Northwest, moss is a part of life. If you leave something outside in the rain, soon it will have moss growing on it. I have to laugh. I left my old watering can out for a month and sure enough parts of it are covered in moss and/or possibly algae. I have moss in my garden beds, moss on the trees, moss on the stone paths, moss on the pots and moss on the roof. I find it humorous that so many people get really upset over moss in the lawn and garden. Moss on the roofs of houses may be a cause for concern, because moss retains moisture. Moisture and roofs do not go together, particularly cedar shake roofs. The extra moisture makes an ideal environment for fungi, algae and mold, which may shorten the lifespan of the shingles. Moss will collect in the detritus of leaves, pine needles, etc. that collect in the depressions of the shingles. However, it has also been proposed that moss protects roofs from the hot sun. Many people apply moss killers such as zinc sulfate or zinc chloride or a zinc-copper sulfate mix to their roofs. These products are toxic to fish and other invertebrates and are harmful to plants that may come in contact with the solution or drift from the spray. The best non-toxic method of moss control is physical removal of the moss by brushing the moss off with a stiff brush and cutting back branches that may be shading the roof. I love moss. It is so vibrantly green and soft. I love all the colors of moss from dark, khaki brown to lime green. Moss is beautiful. 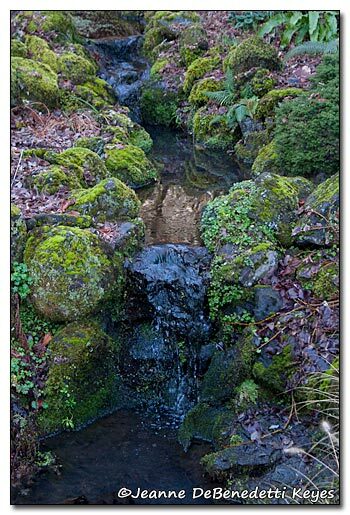 Moss makes this little stream so photogenic, highlighting all of the little pockets and shapes of the beautiful basalt rocks. Moss is perfect for walking over on a warm summer day in bare feet, like little cushions for your feet with each step. 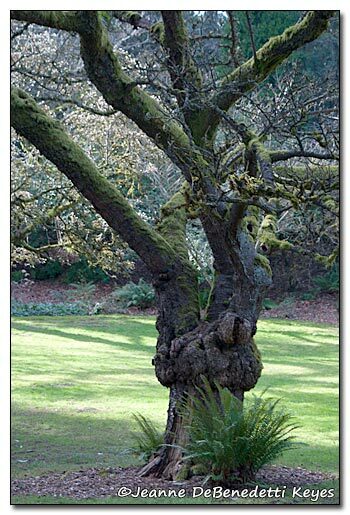 Although moss will become dormant with dry summer weather, it will be fresh and vibrant with the first rainfall. Oddly enough, a moss ground covering is very beautiful but really does take some maintenance. It must be weeded. So, although people joke about how much easier it would be if they allowed the moss to take over the grass, a moss “lawn” is a commitment. I find the task of pulling little weeds gently out of the moss a very Zen activity. Let’s get to the real reason why I love moss. It’s because moss is the Pacific Northwest. What says Pacific Northwest more than the soft covering of PNW forests, rocks and trees? Moss equals moisture, which means rain. Rain is endemic of the PNW. And so too is moss.